Reserva 44 is the most exceptional extra añejo tequila in the world. Crafting Avión Reserva 44 starts with slow roasting select batches of Avión Agave in brick ovens for 72 hours. The liquid is then small batch distilled and undergoes Avión's proprietary ultra-slow filtration method. Finally, the special liquid rests for 43 months in oak barrels and is then aged for an additional month in specially selected petite barrels (rotated daily). Avión Reserva 44 is hand bottled in extremely limited batches and carefully filled into a fire-polished, luxurious crystal bottle. 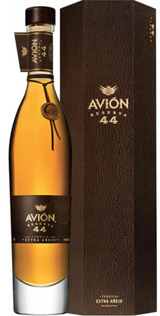 Avión Reserva 44 is a spirit that even the most demanding tequila connoisseurs and single malt scotch drinkers will fully appreciate.